There are many different uses for this chart. I have created this chart with middle school students to help students develop the topic sentence for each of their body paragraphs within a larger essay. I have used this with elementary school students to craft overarching topic sentences (theses) for essays as well. Finally, the most recent use has been to help students (in all grades) to develop the first sentence in response to shorter, open-ended prompts in an effort to craft constructed responses. This example was created with eighth graders who were preparing to take a test where they had to read two different texts, then write about them. Students did not know what type of prompt they would receive, we only knew that it would require some type of explanation and connection between the two texts. I wrote the title and divided the two sides, adding the headings. 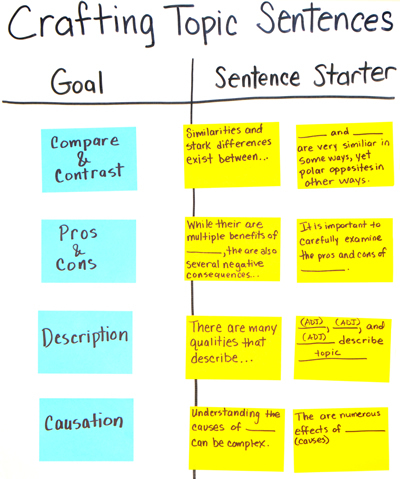 On the left side of the chart I added sticky notes that reflected four possible purposes for writing. On the right side, I added two different sentence starters for each type of writing and we discussed each one. Then, I read several different prompts out loud. After I read each prompt, students were expected to write a topic sentence that could match that prompt. Students knew that they would not actually be writing in response to any of these prompts, we were just using these examples to test drive the sentence starters. In order to be successful with this, students needed to recognize what type of writing matched the prompt and populate a mock topic sentence. After each one, students discussed their ideas in groups of four. Then, we reconvened and each group shared one example. Afterwards, I read a new prompt and we repeated the process again. I used prompts that I knew the students were familiar with because we had read books about the content or they were being covered in another subject area. I needed students to be familiar with the topic, but they did not need extensive knowledge for this activity. The focus is on matching the appropriate type of topic sentence. Explain the similarities and differences between the Union and Confederate soldiers. Describe the contributions of Madame C.J. Walker. Describe the pros and cons of Westward expansion. Explain the causes of the Civil War. This chart is from Chart Sense for Writing. Just wanted to let you know how much I love your books. I blogged today about them and have recommended them to several staff members who have commented on charts I’ve made/used. The ideas you share with each is great, and they often lead me to other ideas too. Thanks so much for sharing your creativity. Here’s the link if you’re curious.